Styled with the icon legging and foundation knot tee . An ideal layer with dolman sleeves, the Vetus goes with eveything and is ideal all season long. Made of a lightweight cotton blend, it's relaxed and super soft. I really like the fit of the sweater, it’s good to wear with leggings or jeans. It’s warm and cozy which is great for the winter weather right now. The sweater is a great length and looks so good with jeans, leggings and shorts! So happy with my purchase. I wanted to love this sweater but from the moment it arrived it has been shedding. There are even threads that are coming loose already and creating little holes. My take is that the quality of this item isn't worth the price. Very comfy but sheds a lot. I love this sweater - fabric and colour. It is really nice and looks awesome with a white t and boyfriend jeans. My only complaint is that it does stretch out with wear and when washed leaves a lot of fluff over the other clothing and in the drier. There is so much lint on the inside of the sweater. I swore it with black pants and my pants were covered in lint. I haven’t really wore it since I don’t know how to get rid of the lint. I love it! So cozy and comfy! I've noticed that it sheds a little bit... wash it separately! I've read the reviews about this sweater shedding but I think it really depends on the colour. I got the beige and found it didn't shed too much but it did pill a bit. I love the style and how I can wear it dressed up or down. It’s super soft but I find that it sheds fibres if I’m wearing something dark underneath it. It fits great. A bit oversized, just how I like it. Classic piece and getting much wear out of it. Love to wear this during fall and spring. But if you wear this type of fabric... it's going to have balls of fuzz from over use. The Vetus sweater is cozy but it fits quite oversized so choose your size wisely, I am usually an XS or S but I should of gotten XXS or even XXXS. The sweater initially has a lot of material that comes off, lots of shedding. I have washed it a few times now and it is better but the first couple washes still had a bit of shedding. Nice and soft. Good for a casual look. It looks great in the pictures but it had lint / fuzz balls all over it. I was so excited for this sweater. I really wanted to love it. I do like the sweater itself, but it leaves a disaster behind. As soon as I opened it, there was fluff everywhere. I was covered, head to toe in very hard to get rid of fluff. It's not washable either. Unfortunately, I still haven’t been able to de-fluff it with a lint roller and constantly leave a mess around me with this sweater. Not to mention the clothes I’m wearing underneath are constantly covered. Not exactly what I was hoping for. I’ve only worn it twice and it is pilling already. Also, the sleeves stretch out a lot. It is comfy and soft. Very pretty sweater and versatile, my only complaint is it sheds a lot of lint especially when wearing black jeans. 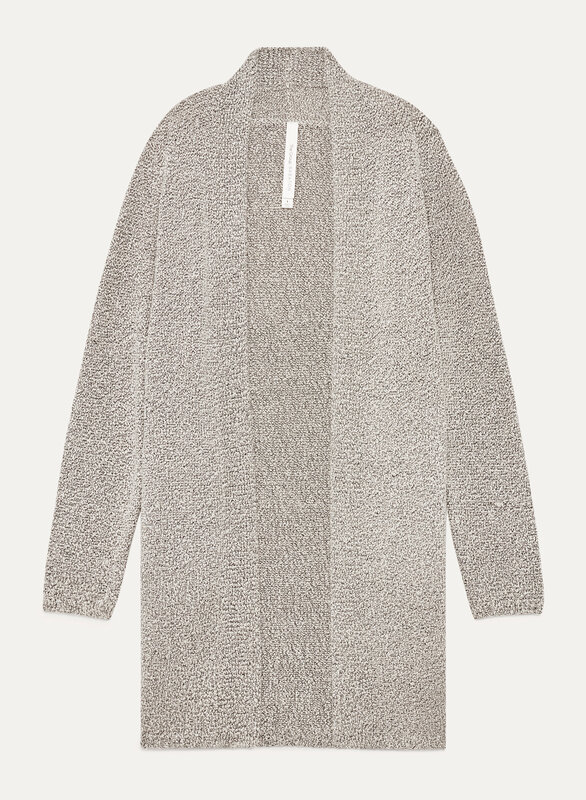 But overall, a great go- cardigan to wear with anything. It’s really nice and soft but it sheds. So it shed in my black clothes. I have this in natural and I love the colour and look of this sweater- looks great dressed up or down with light or dark colours. I rated it only 3 starts for a few reasons: the sleeves are super long- I'm usually a M in aritzia tops and got this in XS and I still have to roll up the sleeves, it sheds like crazy and covers all my dark clothes in white lint, and because it's a fairly delicate weave, I'm not sure how long it will last before getting ratty looking. 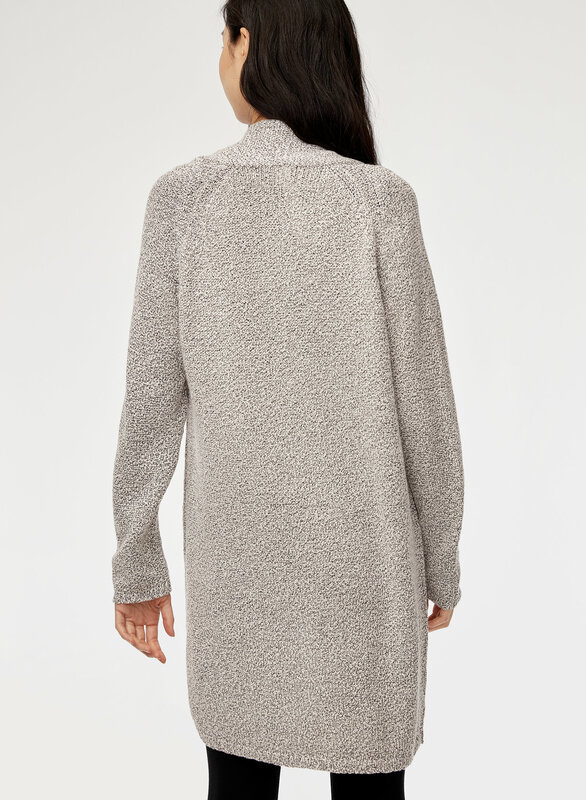 Loved this cozy, soft cardigan! The colour is easy to match with any outfit and is an essential piece in my closet!